Swoop Miami is the new taxi service in South Beach that promises you a free ride, anywhere you want to go. Driven by eco-friendly electric golf carts, they collect passengers from 1st -24th street and between Ocean Drive and Bay Road, covering all of South Beach. All you have to do is tip your driver. The concept of the free taxi service was first seen on college campuses to get drunk students home safely at the end of the evening. 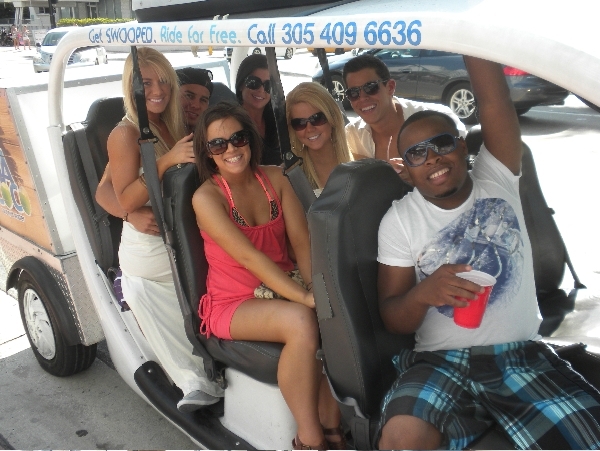 However Swoop Miami is the first company to take the idea off campus and put it into a city and out on the busy streets. Alex Smith is the brains behind Swoop and he created the company while working a full time job. When Swoop first began he would work his day shift and then go out in the evenings to drive the first Swoop customers. This was his test phase for the company to see if Swoop could work. Six months later with the company growing rapidly in popularity, he quit his day job and went to work full time at Swoop. The company now operates 3 vehicles and employs 5 drivers: himself plus Adam Libinati, Eric Stevens, Greg Elsner, and Omarie Williams. The company makes their money from the advertisements on the Swoop golf carts, ensuring a free ride for all the passengers. Swoop will only accept advertisers that share their core values, so you will only see products that are all natural and eco-friendly on the side of the carts. It is very easy to use Swoop. Simply call their number and tell them where you would like to be picked up. The driver gives an approximate wait time and the Swoop car will come to collect you. They will drive you to wherever you want to go in South Beach. Swoop operates 7 days a week, 1pm until at least 2am, but if they are busy they will keep driving until the calls stop coming. Saturday nights they are known to be out till 5:30am picking up the last of their customers. They drive in sunshine or rain, and never turn down a pick up. The only time they do not drive is during flooding or a hurricane. When the cart pulls up to pick you up, don’t forget to call “Swoop Swoop!”. This is the unofficial catchphrase of the company that you hear regularly from Swoop fans as you drive along. It is a completely free taxi service but the drivers work only for tips, so don’t forget to tip your driver! Currently the company receives around 70 calls a day. The local residents account for 65% of the calls and many are regular customers. Some are known to use it daily, even up to three times a day. Swoop regularly take people to and from the grocery store, work places, hotels, nightclubs, on dates and one passenger takes it to her weekly AA meeting. The drivers know their regular passengers, and have been known to drop people home when they are too drunk to remember where they live! Swoop is fast becoming the number one choice of getting round South Beach, and for good reason. The drivers are always friendly, smiling and happy, playing music as they drive round. The open air seating lets you interact with people out on the street, and as Swoop is very well known in the community, it is normal to drive by people who call out to the car, greeting it with “Swoop Swoop!” But most importantly, it’s fun! Swoop has no taxi meter to watch, no crazy cab driver breaking the speed limit, you can meet people from your own neighborhood or tourists enjoying the city, and it’s a very relaxing way to arrive at your destination. So if you are reading this to help you get around during your Miami vacation, or you live here and need to get somewhere on the beach without the hassle of expensive parking, give Swoop a call. You can expect a free, fun ride, and to arrive at your destination with a big smile on your face. 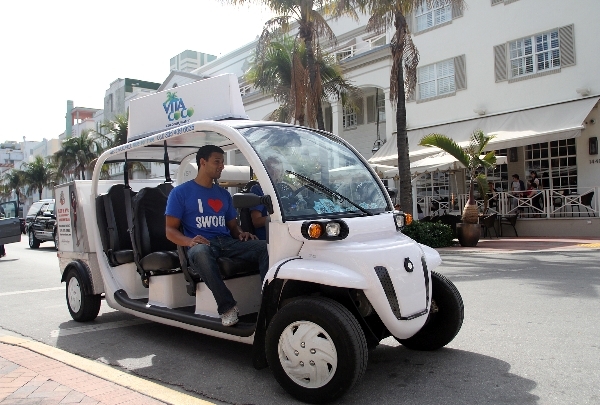 "Swoop Miami: The fun free way to get around South Beach"
Very nice, thanks. Do you know what the average wait is? It truly depepnds on where you are in relation to where the Swoop cart is. I have waited less than a minute, other times 15. They let you know when you call how long they will be. I love your article, Jess, and the service is awesome! Thumbs up to Alex for starting an innovative company that is eco-friendly, cost effective and super convenient! Thank you, Jess! I can’t wait to try this cool service. This is great! cant wait to use it when I go in March. Couple of questions though, what would be considered an average tip for the drivers?? Also is this only call-in service or can you flag one down on the street?? It is a call in service as they usually have a short list of their next pick up. However, I have seen themt drive past before and immediately called them and they have swung back to collect me. Tip depends on how many, where you are going and what you feel is appropriate! Sorry but I would really like to know actually how much to tip them. Like $1? $10? $100.Service charge is normally included in uk so i have nooooo idea. Thanks! It really is up to you. It depends on how far they are taking you, did you have a fun time (of course you will, it is Swoop! ), did they go out of their way to pick you up quickly etc. The last time I swooped, they picked me up from a bar and I reeeeally wanted to go via my apartment to pick up something. The driver Omarie went out of the way to do that and then take me to the next bar. On a busy Friday night. So that was a bigger tip than normal tip from me. Plus, if there is 3 or 4 of you in the group, you have pretty much taken all the seats so leave a bigger tip. I don’t think $1 is enough, but it is a ‘free’ ride, so think what you’d tip in the UK for a cab ride and maybe double or triple it. A tip for me would start at around $5 each ride, depending on where I am going and when. If they pick me and my friends up quickly and make time for us, then we tip way more than that. I’m sorry, but the last two times I was in South Beach I called SWOOP more than a few times… and nothing! No one answered the phone, no one called back. BS! Hey dara, give them a call and ask! There is also a new company called Freebee which is the same as swoop, try calling them too.